Shin-Fuji is litle bit lighter than the Ozora is. Weight of kendama is 133g. 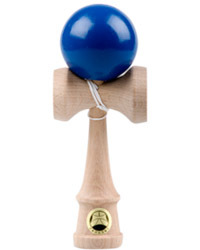 Shin-Fuji kendamas are as good for begginers as for advanced kendama players. They have different colour tints: blue, red, black and natural. They are sold with spare string. Japaneese kendama asosiacion label is black.